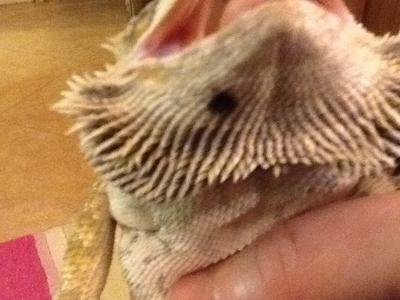 A small black spot has appeared on my lizard's jaw. 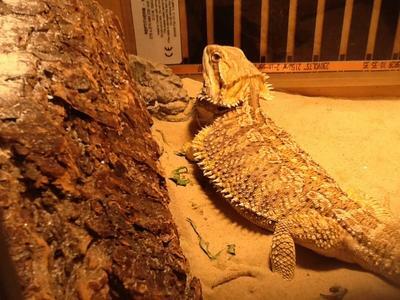 My lizard is also spending more time under his log, but eating normally. Can you tell what this could be and does this require treatment? I am afraid I cannot tell what the dark spot on your lizard’s skin is or how serious a problem it might be based only on a photo. If it seems to be bothersome to the lizard or if it worsens (e.g., grows, a mass is palpable, or the skin changes in any way other than color) make an appointment with your veterinarian for a check-up. He or she may be able to determine what is going on based on a physical exam or by removing a small piece of the tissue and sending it to a pathologist for evaluation. If you don’t have a relationship with an experienced reptile veterinarian, the Association of Reptile and Amphibian Veterinarian’s website is a good place to start.